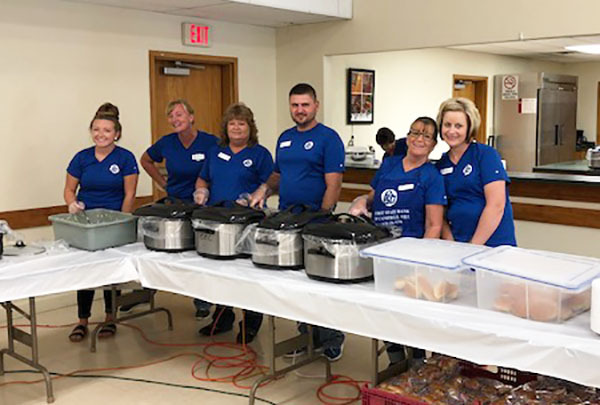 First State Bank of Campbell Hill hosted its 23rd Annual Customer Appreciation Day on Friday, September 7, 2018. The event was held at the Campbell Hill Community Center from 4 to 7 PM. Over 500 guests attended the event. Guests were treated to a meal of pulled pork, bratwurst, hotdogs, baked beans, slaw and ice cream. Carry outs were available as well. In addition to the meal for the evening, guests in attendance were able to register to win a hand-crafted wooden glider. The lucky winner of the glider was Katie Rieckenberg. Katie Rieckenberg & husband Ardell enjoying their glider she won.